On the western end of Bogue Banks is Emerald Isle, North Carolina. Its beaches are private in large part, and the surrounding islands create a many serene coves and inshore passages. To its north lies the Bogue Sound with Cape Carteret and Swansboro on the mainland. To the south is the brilliant expanse of the Atlantic Ocean. Largely uninhabited before the mid 1900’s, the western end of Bogue Banks was home only to the descendents of its original settlers, living in the area of Salter Path and surviving solely on fishing. When investors purchased the area from the government and attempted to evict the residents, the courts sided with the locals, granting them “squatters’ rights,” and allowing them to stay provided that they pay taxes. The locals remain to this day, and the fishing industry on which they built their livelihoods have how become successful family businesses. There are several boat accesses in Emerald Isle and the surrounding areas where fishers can get into the sound or continue offshore. On Emerald Drive, next to Chapel By The Sea, is an access to the Bogue Sound where personal crafts can put out and explore the inshore waterways. The ocean is accessible a few miles to the east via Atlantic Beach. 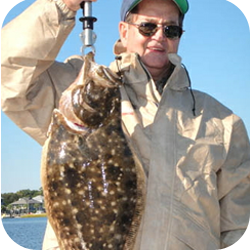 Most people looking to charter a fishing excursion go to neighboring Atlantic Beach. It lies directly on the Infracoastal Waterway, with immediate access to the Atlantic Ocean and offshore fishing. 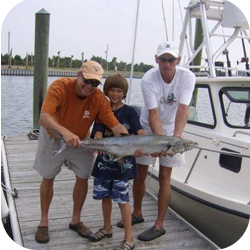 The Gulf Stream brings fish from across the Atlantic through the area, and there is always a variety of fish to be caught.